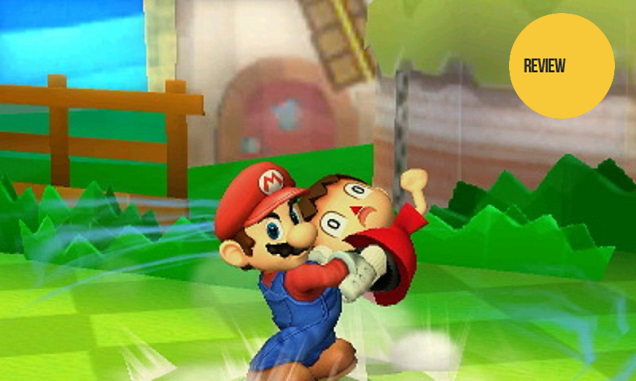 Super Smash Bros., a new piece of fanfiction for the Nintendo 3DS, is a game about anticipation. It's a game about position. It's a game about mustering up the brain juice to figure out what your opponent is going to do next, then developing the lightning-fast reflexes needed to nail the best possible response. It's also a game where Pac-Man hurls pieces of fruit at the dog from Duck Hunt. Much of the appeal in the Smash Bros. series, which gets its newest entry today, has always come from that juxtaposition. On one hand, these are serious fighting games, and to master any version of Smash requires dedication, patience, and routine memorization. On the other hand, there's genuine silliness flowing through every stage, every character, every strike, and every taunt. Thanks to Smash, preposterous battles between the likes of Donkey Kong and Ness from Earthbound or Ganondorf and F-Zero's Captain Falcon have become part of gaming's canon, and there's even a passionate community of professional players dedicated to turning Smash into a serious eSport — no small feat when one considers that this is a video game in which Mario and Pikachu must battle to the death. With this newest incarnation, Smash Bros. again walks that fine line between serious and silly, offering a stellar, eclectic roster of characters as well as more items, customisation options, and trophies than you'll ever know what to do with. This is the best-looking Smash game yet, with the strongest lineup of characters and some of the most interesting stages we've seen. Yet it is also trapped on the 3DS, a system that feels somehow both liberating and smothering for Nintendo's mascot fighter. Smash Bros. is perfect for the type of quick, bite-sized action you might want while riding a subway or lying in bed, but it's also a game ill-suited for the 3DS's flimsy circle pad and minuscule trigger buttons. Still, this is mostly Smash Bros. at its best. And Smash Bros. at its best is better than most things. Super Smash Bros. 3DS is the fourth Smash Bros. game, and it will soon be joined by a fifth, for Wii U, which will come out at some point in the near future. (More on that later.) Like its predecessors, Smash 3DS is a mascot fighter in which iconic Nintendo characters such as Mario and Link take on other, less iconic Nintendo characters such as King DeDeDe and Pit along with a smattering of non-Nintendo characters such as Sonic and Mega Man. 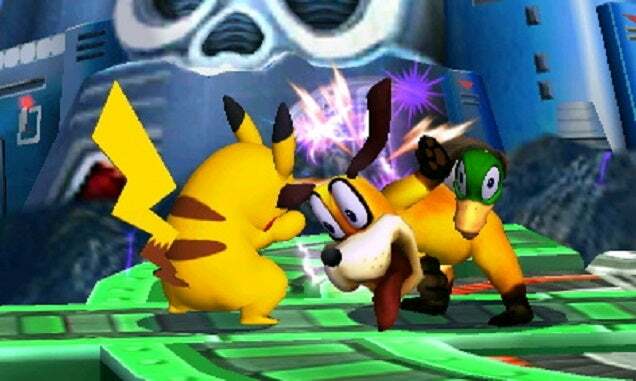 In case you have never played a Smash Bros. game before, you should know that it differs from other fighters in two key ways: 1) rather than pummelling enemies until they die, your goal is to knock them off a stage; 2) the number representing your "health" actually represents how much damage you've already taken — the higher the number, the more susceptible you are to getting knocked off. Once that damage number gets too high, your character will start flying around like a crash test dummy when hit by even the least powerful of attacks. So the goal is to both stay on solid ground and keep your damage down. Some people like to play Smash as a button-masher, and that's perfectly fine. There is a great deal of fun to be had in Smash Bros. 3DS by simply picking a character and mashing your way through Nintendo icons, chucking bombs at Dr. Mario and floating across the stage with newcomer space princess Rosalina. The novelty of familiar characters battling to the death is fun in and of itself, as fans of the old show Celebrity Deathmatch will attest, but Smash 3DS also feels great to play. The pluck of a Mario fireball is satisfyingly smooth; the slight resistance before smashing an opponent into oblivion makes every blow seem all the more powerful. Zipping around the battlefield and whittling down your enemies as you attempt to outmaneuver them off stages is as fun as it ever has been. It is tough, however, to reconcile the smoothness of the game's free-flowing combat with the semi-stiff controls of the 3DS. 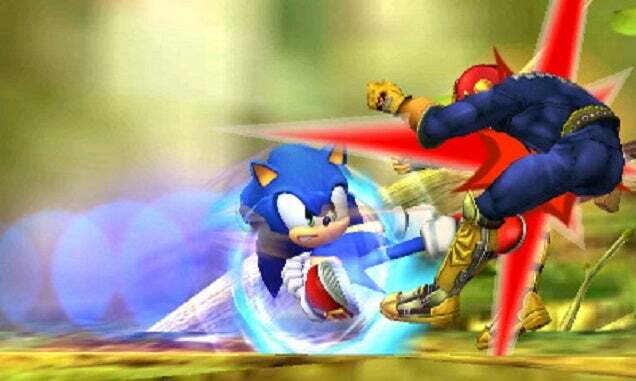 To properly execute powerful smash attacks in Smash Bros., you need to flick sharp moves with your thumb, which in past games required a standard control stick. On the 3DS, you're stuck with the flat circle-pad, which feels weird, like trying to thumb-wrestle a nickel, as Stephen puts it. I played on a 3DS XL and found that the circle-pad just wasn't precise or comfortable enough to input the sort of rapidfire moves one might want for a game like this. Some of the controls are customisable — I found it much smoother to flip the predetermined "grab" and "shield" moves to the left and right triggers — but the 3DS's directional buttons are reserved for taunts and can't be used for movement at all. We're stuck with the circle-pad. And if you're anything like me, you'll find yourself frustrated by the lack of a real analogue stick (and constantly knocking up the volume slider while trying to pull off smash attacks). This is a problem, and it's one that some gamers have already tried to mitigate with clever modding and the old trusty GameCube controller. A fighting game lives or dies on precision, especially at the highest levels, and it's hard to envision this version of Smash making many waves in professional circuits due to the inferiority of the circle-pad controls. Fortunately, Smash Bros. isn't just a regular fighting game. Thanks to the frenetic speed of 3DS-exclusive stages like the constantly-moving Spirit Train from Zelda: Spirit Tracks and the coin-fuelled Golden Plains from New Super Mario Bros. 2, playing most modes in the new Smash is diving face-first into chaos. New items such as the magnetic Boss Galaga and an overpowered little prop called the Special Flag, which gives you an extra life (or extra time) when you hold it up for long enough, can instantly alter the course of any battle. Matches in this new Smash game are full of constant distractions and annoyances, which is a large part of what makes Smash Smash. High-level players will undoubtedly prefer to play without items, which is an option. They will also appreciate a new feature that lets any stage morph into a flat level, Final Destination-style. At its upper echelons, Smash is about position, space, and finding ways to get advantages over your opponents; this new version makes that process more fun and interesting than ever, even with the aforementioned control flaws. It's a bit faster than Brawl, a bit slower than Melee, and more technical than either. The perfect balance. Also alleviating the control issue is the 3DS' one big advantage over any other Smash Bros. game to date: it's portable. You can play this version of Smash Bros. on your bus to school or during downtime at work. You can sneak in a few quick matches before bed. You can take advantage of sleep mode to jump in and out whenever you want, without having to worry about setting up the TV and turning on your console. That's a big plus, and it's the number one distinction between Super Smash Bros. 3DS and its Wii U counterpart, which Nintendo has slated for this holiday season. The distinction is important, because that Wii U game is lurking, looming over this version to the point where my immediate reaction, when asked about the new Smash, is to tell people just to wait for the one you can play on an HDTV. Because Smash 3DS isn't the game you'll be playing drunk with roommates in your dorm room or enjoying with friends at an upscale cocktail party. This is the portable version — Super Smash Bros. on the go. Many will want to wait for the Wii U incarnation, which will be playable with GameCube controllers, in your living room, on a big-screen television, where Smash has fit in so adroitly over the years. In many ways Smash 3DS is a totally different type of game, more fitting for solo play and quick sessions than big tournaments or get-togethers. For both casual and high-level players who want to choose between the two versions, Super Smash Bros. Wii U may be the way to go. This is not a review of that version, though. This is a review of Super Smash Bros. for 3DS, and after around 18 hours of play, I feel confident telling you that yes, issues aside, this game is worth your time. 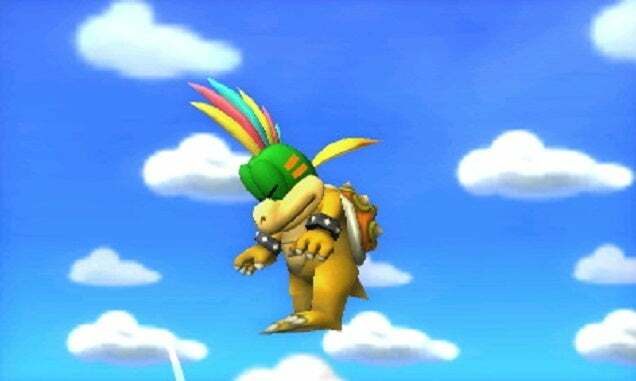 Let's talk about Bowser Jr.
Bowser Jr., the heir to Koopa Kingdom whose father is most certainly Bowser but whose mother remains one of Nintendo's biggest mysteries, makes his debut appearance in this version. He wears a bib and rides a clown car. His alternate costumes are the seven Koopalings who all fight just as hard, probably because none of them know who their mothers are either. This junior version of Bowser is one of the most interesting characters in the game, combining the speed of Kirby with a bizarre moveset based on the weapons in his clown car. Hit A and little Bowser will pummel enemies with boxing gloves, or dash-A to stick out a sawblade. 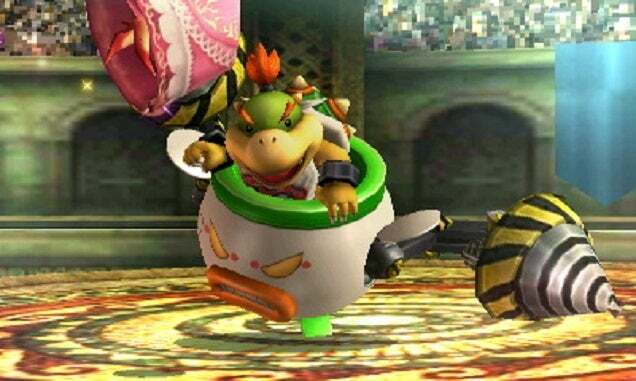 Bowser Jr.'s regular smash is a giant drill, while his lunge attack is, for some reason, a giant fork. His special abilities are equally unique — he can fire cannonballs, leap out of his clown car for recovery (leaving the car to explode behind him), and even launch mecha-koopas that blow up on contact, Super Mario World-style. My favourite Bowser Jr. move, down-A, makes his clown car stick out a tongue, spraying saliva and knocking down anything in its path. This is Super Smash Bros. at its juicy cartoon core: weird characters with weirder sets of moves that are zippy, surreal, and fun to play. When Bowser Jr. attacks or takes damage, his clown car changes expressions, flipping between angry smiles and frowns as Bowser's heir seeks vengeance on his opponents. His moves are a blast to watch, and they feel great to use. And that's just one character. What's particularly impressive about this version of Nintendo's mascot fighting series is just how robust and interesting the roster is. Super Smash Bros. 3DS has 49 characters, and though some are clones — go away, Dark Pit, nobody likes you — the bulk of the lineup is top-notch. The game's creators added new moves to old favourites and introduced challengers the likes of which we've never seen before. No Smash character has ever moved with the creepy elegance of the Wii Fit Trainer, or trolled opponents as hard as the devilish Villager, who drops bowling balls and throws broken vases at enemies' heads. Some great characters are missing — RIP Ice Climbers — but the newcomers make up for whatever was lost. 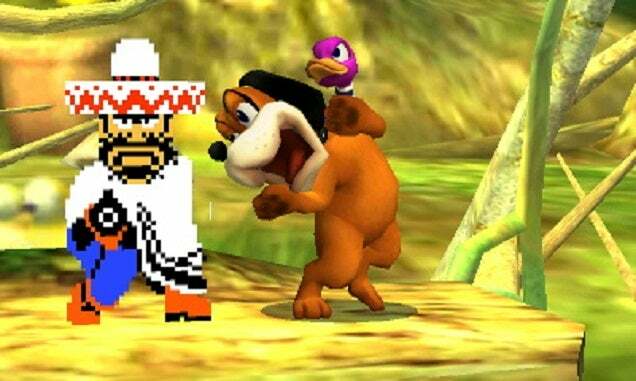 The Duck Hunt dog, another bizarre addition to the roster, has an array of unique ranged moves that, when executed properly, can cripple opponents no matter where they try to go. Mega Man, using a collection of weapons he stole from other robots, has impressive variety ranging from the near-useless Leaf Shield to the essential Air Shooter. 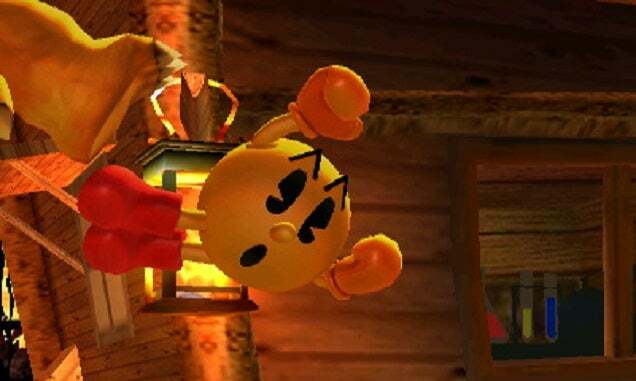 I didn't care much for Pac-Man, who is a smidge too slow for my tastes, but watching him transform from anthropomorphic M&M to pizza-mouthed ball never stops being hilarious. Really, though, it's Bowser Jr. who may do something that no Smash character has done in 15 years: get me to stop maining Kirby. Years of playing Super Smash Bros. have turned me into a no-nonsense competitor when it comes to mascot fighters. No items, Final Destination, pure combat, that sort of thing. But for the sake of thoroughness, I spent some time delving into all of Smash 3DS's various options and tools for customising characters. Way more disappointing is the Smash Run mode, which Nintendo has been touting as the 3DS game's big exclusive feature but doesn't hold a candle to, say, Brawl's Subspace Emissary single-player mode. In Smash Run, you and up to three other nearby players (or AI opponents) spend five minutes running around a big map, defeating NPC monsters and opening treasure chests as you collect stat boosts for the character of your choice. Once those five minutes are up, you take those stat boosts to a randomly-determined battle of some sort, like a timed one-minute four-person brawl. Problem is, that final battle is almost always anticlimactic — after five minutes of wandering around, grinding up your character, to only get a minute worth of battling leaves the whole thing feeling kind of pointless, like an RPG that gives you sacks full of money but nothing to spend it on. And what of online multiplayer, a feature that flopped so painfully with Super Smash Bros. Brawl on the Wii? Over the past two weeks, I've played dozens of matches online, attempting to connect to the Smash Bros. network from three different internet connections. Every single one of those matches has been laggy. At best I'd just run into minor input lag; at worst, the frame-rate would drop to single digits, rendering those online matches totally unplayable. Sometimes I couldn't even connect to the network at all. While my experience may have been tainted by the lack of U.S. players — most of my opponents so far have been based in Japan — I have yet to play a single solid game online. Matches against other U.S.-located Kotaku writers have also resulted in lag. I tried to play a bit more online this morning now that the game is out in North America, and had a little bit more success, but one of my four-player matches was so laggy that I had to stand still and idle out of the game. It's a real bummer. Playing offline with friends is more effective. Via local wireless connection, the game ran perfectly smoothly in Kotaku's offices, though the maximum range capped out at around 12m-15m. If you want to play with other 3DS owners, that's likely your best option. Despite all those negatives — the controls, the online lag, the underwhelming Smash Run — Super Smash Bros. 3DS does so, so many things right. Not just big things. Little things. Ness' stage, Magicant, plays clips from the Mother series in the background as you battle. The Villager's umbrella has little paw prints on it. When Mega Man dies, he explodes into bubbles. Kirby grows a ponytail when he steals powers from the Wii Fit Trainer. So, yes, what we have here is a very good Smash game. A great Smash game, even. What remains inconclusive is whether this will ultimately feel like a healthy complement to the console version — a version expected to have the same character roster but different stages — or a stopgap while we wait for what could very well be the superior, definitive Smash Bros. game of this generation. For now, well... this is what we've got. And what we've got is pretty damn great. I hope the WiiU release turns into the best Smash since Game Cube or even 64 (depending on your fave). This 3DS version seems like they are on the ball but still, people need more than the 12 reasons so far to get a Wii U it seems. What are the 12 reasons? I can only think of 1 - MarioKart 8. It's more 11 then seeing as Shovel Knight hasn't been released on the Australian store. An Xbox One is the machine with no games and no point of existence yet everyone focuses on the Nintendo stigma. It's really a pity that they chose to keep both the 3DS and WiiU versions so interconnected. It means that the platform with most room to grow (via DLC) will always be gimped to be able to remain faithful to the small one. I also have to question the wisdom in pushing earlier the 3DS version (an unarguably successful platform that doesn't really need more help) than the WiiU version, the platform that needs all the help it can get. Maybe, if the WiiU version were to be the "definitive version" of the game (more characters, items, stages, etc.) this early 3DS version could serve as an appetiser or advertisement, but it seems that the only significant difference is going to be the resolution/lack of portability. So you are saying that the WiiU can't have say extra characters for some reason because the 3DS couldn't support it? I don't see that as an issue. It's not official that there will not be additional DLC characters, but when the two games were revealed one of the first things asked to Sakurai was whether the console version would have more content than the portable one and he answered that they were keeping the same amount of characters in both versions the same so players of the 3DS game could play with WiiU players. My brother pre-ordered the 3DS version, and he's so addicted to it, HE EVEN SAW THE 3 MAJOR SPOILERS!!! IT EVEN SAID "WARNING: Major spoilers inside"!